inkXE Awarded for Best Innovation in E-Commerce. We were recently recognized by the Software Technology Parks of India (STPI) for our excellence in innovation. The award for “Innovation In Ecommerce 2015-16” was given by the honorable IT minister of Odisha, Sri Pranab Prakash Das, at Hotel Crown, Bhubaneswar. STPI is a body that encourages growth and development of information technology in India. 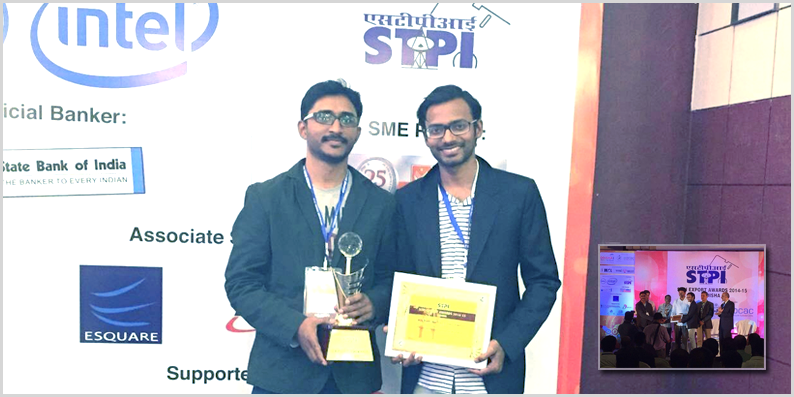 The co-founders Susrut Mishra as well as Subrat Acharya together collected the trophy on behalf of the entire team of Riaxe. STPI is a society with its inception in 1991 by the Indian Ministry with the aim to encourage and promote the export of software from India. It maintains and internal engineering resources to provide consulting, training and implementation services. The range of services also covers network design, software installation, operations of application networks. It provides various benefits to the registered units, including 100% foreign equity, duty-free indigenous procurement. Since its inception in 2006, Riaxe Systems has become a leading provider of high-quality software services. We have catered to hundreds of customer from across the globe. We started with just a handful of professional and grew since then to accommodate over 90 professionals. At our core, we deliver solutions with perfection. We also are constantly working to grow our workforce and expand our business to new horizons. Therefore, our team doesn’t shy away from implementing new technologies to bring more seamlessness to our services. Our company is constantly growing by making new business connections to reach its full potential. Riaxe provides an array of diversifies software solutions to global customers. Our plethora of services includes web development, cross-platform mobile app development, desktop as well as web application development, games development, ecommerce solutions, CMS solution and more. Therefore, we make sure, we are in line with the latest design trends and technologies to meet the changing needs of our global clients. Our motto is to provide our customers a comprehensive software development solutions that no other can provide.